“Mom?” a week or so into the school year my six year old is showing me her homework with the signature “bird head” she always draws after her name. “The teacher said now I’m in first grade, and I can’t draw that as part of my signature anymore.” The bird head had actually started out as a mistake- a little extra line she drew after the last letter of her name- which looked to her like a bird beak and so she added a simple head and eyes and neck. 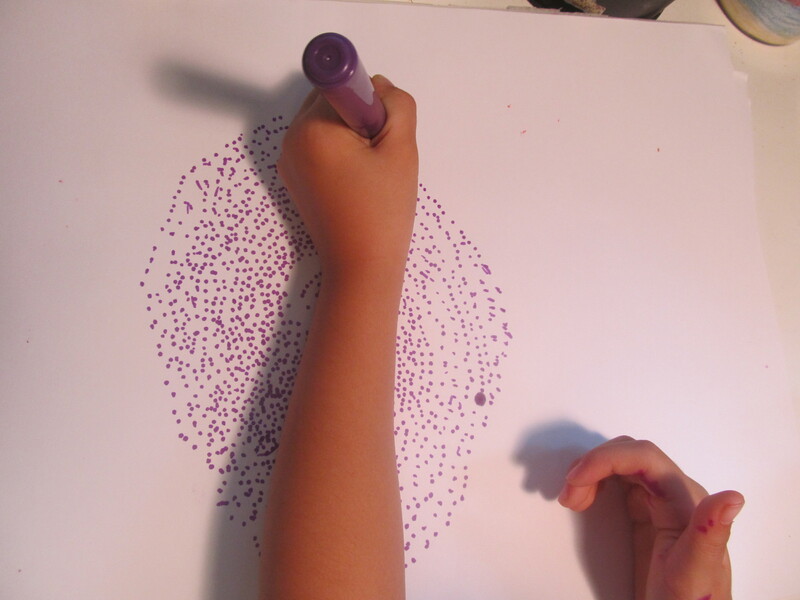 Throughout kindergarten, she’d been allowed to draw it as part of her signature on class worksheets and homework. But having heard about her new teacher, I wasn’t surprised. “Well, yeah, you’ll probably have to just do that at home now,” I say, feeling sad. All of this was both on a conscious and unconscious level. I did read books on children and creativity including a 500 page book on the origins and philosophy of Reggio Emilio schools in Italy. I read about the importance of the third teacher- the environment, and the beautiful art ateliers and open piazzas in the middle of schools. 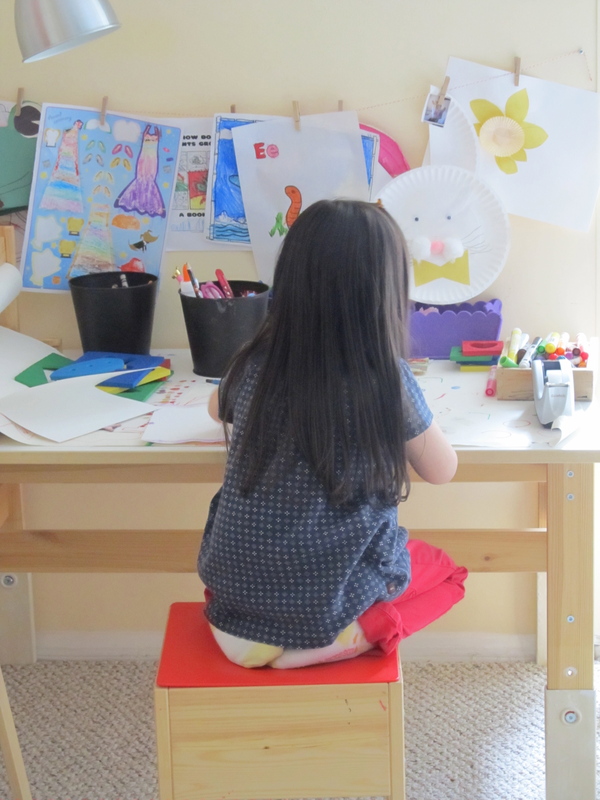 I was inspired by the blogs of women not only making their own chocolate-scented play dough, but actually doing genuinely creative artwork with their children. 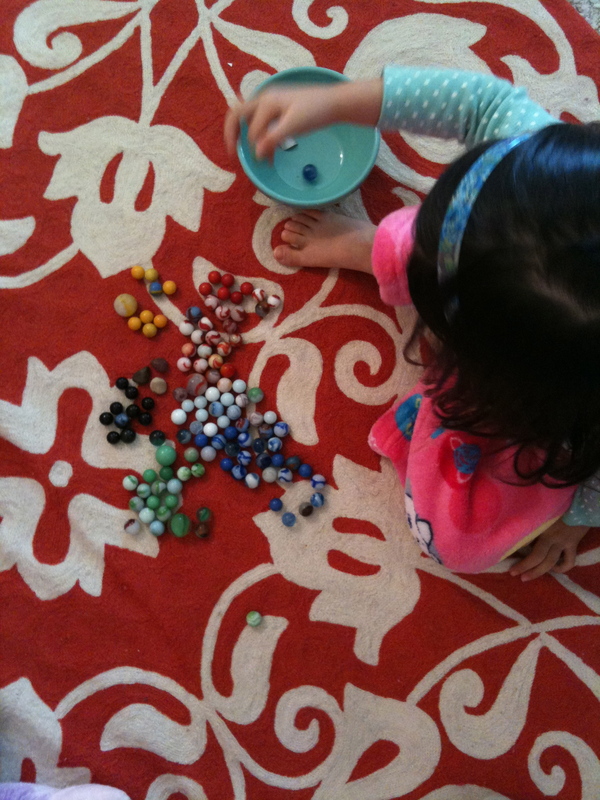 I dyed different shapes of pasta rainbow colors, made a tree house out of cardboard, prepared a giant dress up bin for my daughter where new things – a scarf, a hat, sunglasses- mysteriously appeared every now and then. Last summer when I took my first sketching class, I bought her all of the same supplies I bought for myself- a Moleskin watercolor journal, and professional quality watercolors and brushes. And so, art became an integral part of our lives, almost like another family member. Expressing ourselves through a craft was a part of who my husband and I were individually and as a couple. The first time we met it was to share our songwriting with each other. We produced a CD together, played gigs in the city together at the Bitter End and CB’s Gallery. After we were married, on a typical Saturday morning, I might be taking a collage class at the Brooklyn Botanical Gardens while he road the train around the city filming this little paper man he’d made in different NYC settings as a video backdrop for a song. We attended churches full of fashion designers, artists, and musicians. We lived a creative life. So even though it felt like that life evaporated within the two years I had a child, moved to Jersey unwillingly, and lost my husband, finger painting with my two-year-old, or cutting up magazines for her to stick on clear contact paper collages on the wall- was a way for me to maintain some kind of continuity with who I was. 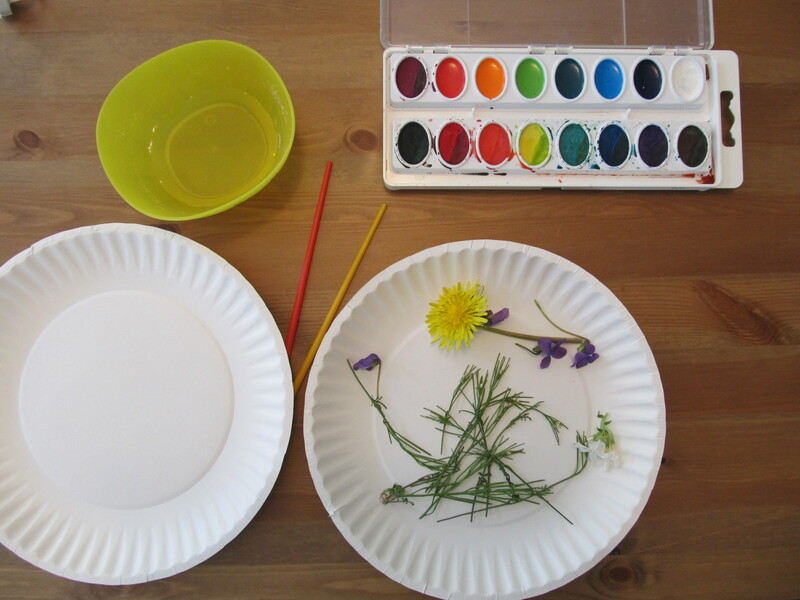 Art therapy had also been recommended to me by my own grief therapist as a way to help my toddler process her grief, and I found that beyond the grieving process, it became one of my most utilized parenting tools. Not to mention, the first couple of years after my husband died, I was so drained from grieving, and had so little energy, making art gave us both something low-key to do that didn’t require a lot of physical effort. I praised any of Audrey’s creative efforts, and as a struggling perfectionist myself, I emphasized the fact that there are no mistakes in art. Probably as a combination of nature and nurture, my child’s creativity flowed freely. She had at least five imaginary friends as a toddler. During her princess stage she called herself, “Arianna.” “Ari means all and Anna means princess- I’m a combination of all the princesses.” By age 4 she had created an entire land named after her, with written rules pinned up on her bedroom door like “It’s always summer, but never hot.” “Glue doesn’t dry on your fingers.” “You can eat as much candy as you want, and never get cavities.” She drew a flag for her country, and a map that included special instructions to head to Hawaii and then take the flying unicorn to outerspace to the planet where “Audreyland” exists. I delighted in these creative expressions of who she was. What I wasn’t prepared for was that just a few short years later, after I’d poured all of my efforts into growing an independent, creative, artistic child- I’d be sending her to a public school where the focus would be on raising her hand to speak, walking in a straight line behind another student, and sitting quietly at her desk- doing worksheet after worksheet. It was one thing if she was bored, or unengaged; I could supplement at home. But the bird head was part of her very identity- and I was slightly heartbroken to see it leave so soon- at just barely six years old. A few weeks later, her homework came back with a “Regular writing on homework please” in green ink at the top. She hadn’t done the bird head, but on that particular day she had added some lovely swirls to her name. She promised me she had extra time to write her name on the homework and it in no way impeded her work. I knew this to be true, so I wondered- what’s the big deal? She can’t add anything at all to her signature? I could understand if she was struggling to write, but she has very neat handwriting, and she’s in the most advanced reading and writing group. Now, I felt a little ticked off. I even posted a picture of the worksheet on Facebook and artistic friends and musicians- many of them my husband’s, rallied around me. Still, I wasn’t sure what could really be done. 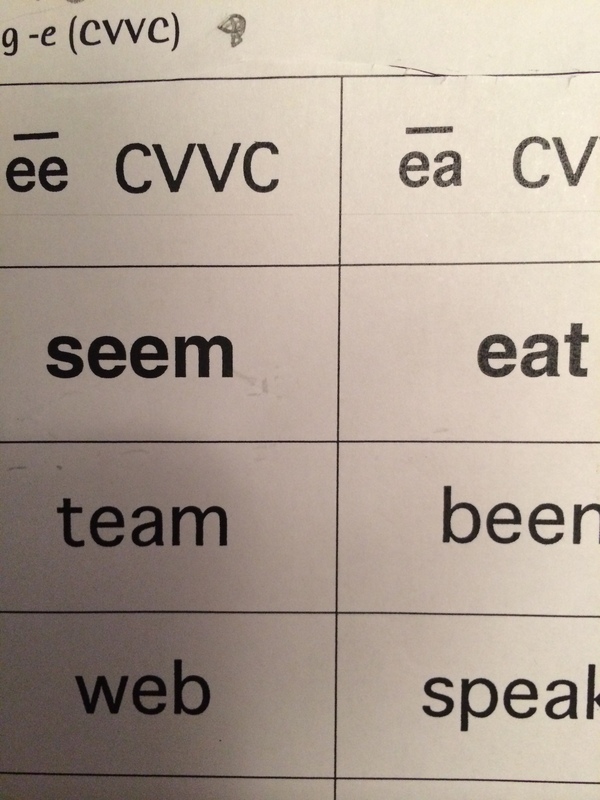 In November, my daughter’s folder contained a thick packet of worksheets about Thanksgiving. 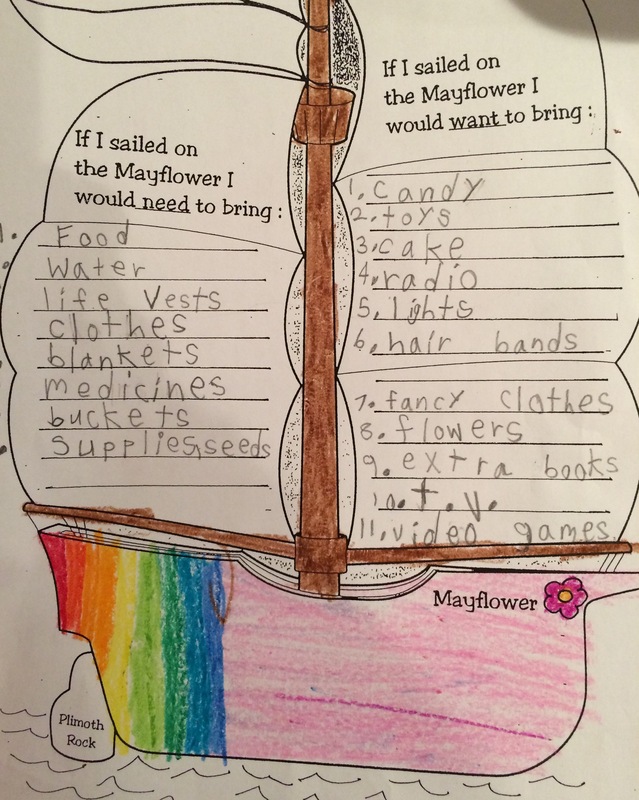 One of them had a picture of the Mayflower they were to color in (with the word Plymouth Rock misspelled no less). I noticed half of her ship was rainbow colored, and the other half was pink- but it wasn’t until the next day she explained why. “I wanted to do my ship rainbow colored, but the teacher came around and said, “Ships aren’t rainbow colored, Audrey.” “What color were the other kids’ ships?” I asked, feeling myself start to tremble. “Brown,” is her answer. Even though I’m usually careful not to let my daughter see any negative feelings I might have towards her school or teacher, I let her know that mommy didn’t agree with her teacher, and that I want her to keep being her creative self. I also sign her up for an art class at a nearby studio. And then one day, about a month later, after school, she takes out her folder and whispers to me, “Mom- I’ve been drawing the bird heads really tiny on my papers so the teacher can’t see them,” And she shows me one proudly. It’s so small, the teacher probably can’t distinguish it from a stray mark. But there it is- the bird head is back. I feel a huge wave of relief. I laugh a little, and give her a hug, and a high five. When I was a new mother- I remember reading that saying, “You can’t prepare the path for your child, but you can prepare your child for the path.” Looking at the tiny bird head, I know she is prepared, her identity well established, even if it has to keep a tiny bird head as a place holder while she’s at school. The teacher may not see it, but my daughter knows it’s there. Even though she’s only six-years-old, I often feel such admiration for Audrey. Her persistent bird head speaks of how we as humans preserve our identities in difficult spaces. Before he made it as a full-time musician, my husband used to listen to music on his iPhone to and from his draining office job- often composing and notating his own songs on the bus or subway. After he died I found a record of these songs and melodies in the voice notes section of his iPhone. In the background I can hear he was getting on a train or bus, or walking on a busy city street while quietly singing a little melody into his phone. It was his placeholder while he worked at a 9-5 day job for many years. But later it became so much more than that; it became his path. Those little melodies that haunted me as I held his phone up to my ear listening to him hum or sing as though he were alive and well on the other side of the line, were the notes with which he hung on for dear life to who he was and what he was meant to do. My job as Audrey’s parent is less about helping her become who she’s meant to be, and more about helping her preserve who she already is- her freedom of expression, inventiveness- her way of seeing the world. While I often wish I could afford to send Audrey to a different school where her creativity can be nourished and appreciated, this hidden bird, this small act of defiance from a practiced rule-follower, tells me that she’s going to be OK, that she’s not going to go down without a fight, that somewhere, even amidst the test-centric, rote learning she does, she will find the space she needs to survive. In real life, few of us get to attend a school with a piazza and an atelier fully stocked with art supplies. In real life, what we believe in and who we believe ourselves to be, is often put to the test. As a young widow and only parent, I myself feel quite lost these days in a middle class suburb of mostly intact families. But I carve out this space you’re reading right now…these words and sentences where I feel at home, like myself, and just as my husband did with his softly hummed compositions, I too hang on for dear life. I am so moved by your story. You are such a great mom. What a stinky teacher. You know how I love that armoire! Public school…I feel you. Oh Julia, it’s such a pleasure to have found your writing again! Audrey is creative and delightful and you are an awesome mother. This jump forward from Dear Audrey is breathtaking, thank you for sharing. Thanks for being a faithful reader and support to me Lori. I hope you’re well. I just found your blog thanks to Rachel Macy Stafford. What a lovely post. We do a lot of crafting around here but you’ve inspired me to take it to the next level. My kids have been making Valentine’s for friends for weeks! They love to create and it feeds their little souls. That little rainbow mayflower particularly touches my heart—you go Audrey. Boats can be rainbow colored. 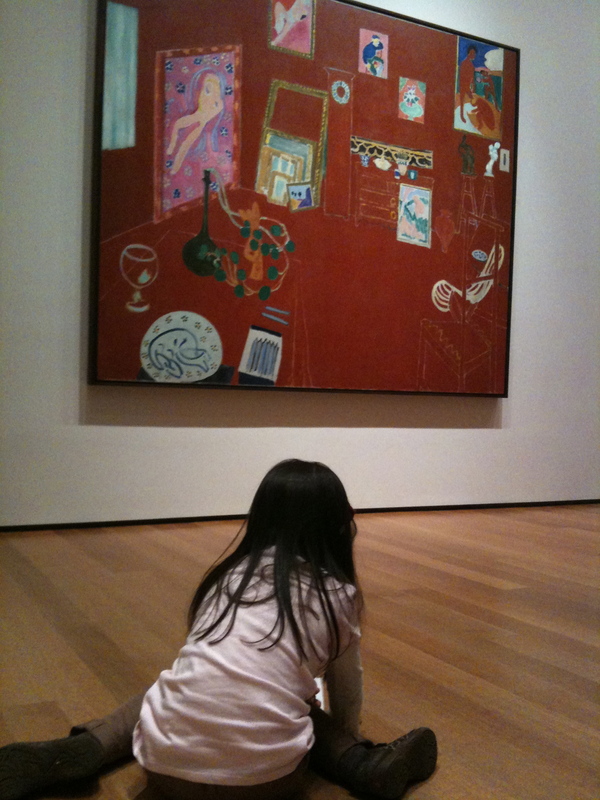 What you’re teaching her at home will overcome teachers who put the kabash on her spirit. Loved this post and catching up on many others. Thanks for your inspiring words. I just found your blog, and love this beautiful post. It was so scary for me to send my children to school, and for seven hours a day to leave them in someone else’s hands. That tiny bird head says so much, though. After seven years of staying at home with kids, writing is also my tiny bird head now, and I am so grateful to have found it again. Thank you for sharing. Oh that teacher really doesn’t get it. How infuriating! It’s first grade not business school. Wow. Not all public school teachers are like that, maybe you could try to scout out a teacher who is encouraging regarding creativity for next year… It’s hard though, navigating public school. I feel for you, we’re in the same boat. I love your daughter’s bird head signature and her creative way to sneak it in! The sad truth about life is, as she’s already learning, is that some rules are BS but how great that you’ve let her know you’re on her side (without making her teacher a villian, even though I kind of think she is!). Your home is where she can always feel comfortable expressing herself and that is a tremendous gift. Hi Julia, I also found your beautiful writing through Rachel Macy Stafford. As an educator, this story broke my heart. I love how you handled it, though. It reminded me of the Harry Chapin song, “Flowers are Red.” Perhaps burning a cd with a copy of that song would make a good end-of-the-year teacher gift? I’m kidding, but I pray that Audrey has a second grade teacher who sees her gifts and allows her to express them. Thanks for writing Alison. I’m glad to hear I’m not over-reacting and other people find it heart-breaking. I’ll have to listen to that Harry Chapin song. Thanks for your prayers for second grade! Reading your blog from first to last article, I was wondering what your heart said about sending your daughter to school. And here is my answer! I wouldn’t be able to be so mild to the teacher! You don’t have the choice to get your daughter in another school, you write. But you have the choice to be the mother you are, so she doesn’t leave her genius, creative self.